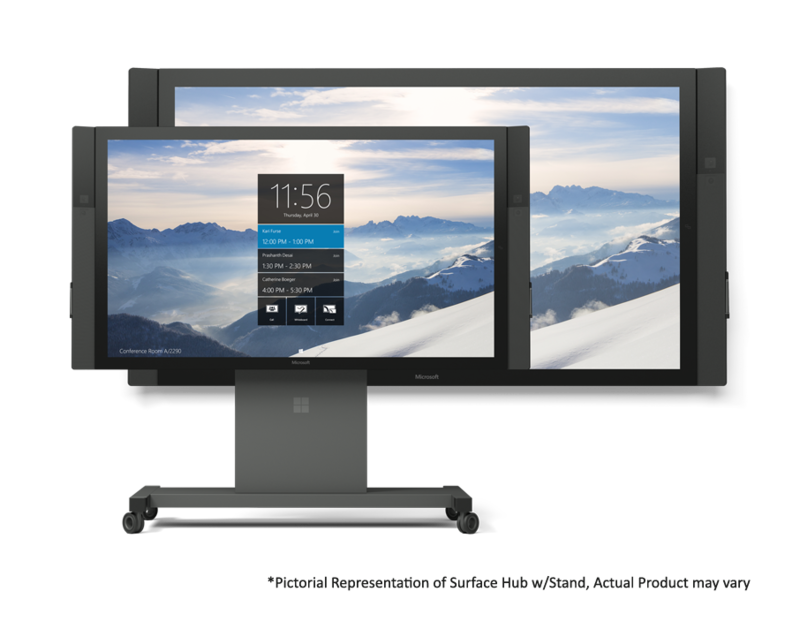 Microsoft Surface Hub 84 - Microsoft Surface Hub is a multi-touch collaboration device that unlocks the power of the group. Home → Skype for Business Devices → Microsoft Surface Hub 84"
Surface Hub also available in 55"
Please call 800-641-6416 for pricing and order information. Ideal for larger settings like medium and large conference rooms, the 84” model allows three people to comfortably interact with the screen simultaneously. 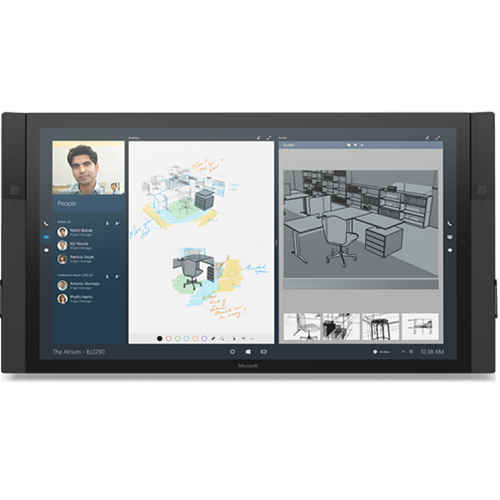 With 4K resolution on a very large display, it also makes a great place to share and analyze data. With natural inking and advanced touch capabilities at its core, the 84” model makes collaborating on a large screen both inviting and easy. Schedule meetings in advance with Skype for Business or invite remote attendees ad hoc when you want to bring them into the discussion. Start meetings on time with a tap of the screen. End your session with an option to save and send meeting content to the group for later use. Everyone can see content and contribute equally no matter where they are. Clear sound and high-quality video make meetings great. A responsive and natural inking experience that feels as fluid as a pen on paper. Advanced touch capabilities recognize up to 100 touch points with precision, allowing multiple people to interact with the screen simultaneously. A new experience for Windows 10 that is tailored for group use, with ink and touch at its core. Many applications can be used without authentication. Microsoft Surface Hub comes with Microsoft Office apps like Word, Excel, and PowerPoint, plus the OneNote whiteboard and Skype for Business. Use the OneNote whiteboard to share ideas on an infinite canvas, paste and annotate content from other apps, and bring remote participants into the brainstorm. Save your whiteboard as a rich OneNote file and email it to others so your ideas don’t evaporate when the meeting ends. You can run universal Windows apps natively from Microsoft Surface Hub or connect applications from your personal device. Microsoft Surface Hub includes familiar Microsoft software and services that your business relies on, like Skype for Business, Office, and OneNote. Build amazing experiences, designed specifically for your business, on the Microsoft Surface Hub platform. Scheduled or spontaneous - Schedule meetings in advance with Skype for Business or invite remote attendees ad hoc. One-touch meeting start - Start meetings with a tap of the screen. End your session with an option to save and send meeting content. Easy to share content - Share content from laptops,tablets,or phones.